On Jan. 24 the City of West Hollywood is launching a promotion for Eastside residents of video home security devices by Ring – devices that have been criticized in the tech world for Ring’s inability to keep the videos safe and secure. Ring “has a history of lax, sloppy oversight when it comes to deciding who has access to some of the most precious, intimate data belonging to any person: a live, high-definition feed from around — and perhaps inside — their house,” said a story published earlier this month by The Intercept, an online news site known for its investigative reporting. In a press release, West Hollywood says the city is partnering with Ring to provide discounts for residents who want to purchase the Ring security devices. Under the partnership, the first 200 eligible households will receive a $100 promotional code rebate towards certain Ring products. The rebate program is open to West Hollywood residents who live within an Eastside Neighborhood Watch area and attend the kick-off event in person. The event is from 6 to 8 p.m. at Plummer Park’s Fiesta Hall, 7377 Santa Monica Blvd. Ring was recently acquired by Amazon for $1 billion. “The program is organized by the City’s WeHo Smart City Initiative with the goal of creating a citywide network of greater safety and security for residents,” the announcement says. 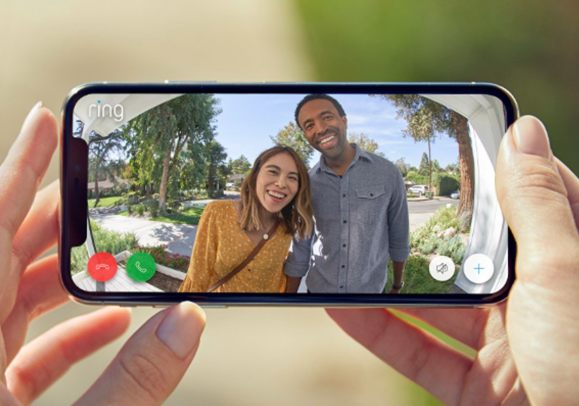 Ring offers a variety of products that capture videos of people. The video doorbells provide images to the home dweller of the person outside ringing the doorbell. Those videos can be viewed on a mobile app even if you are away from home and at work. Ring also offers a “stick up cam,” which is a video camera that can be hung from a wall or ceiling or placed on a table. There also are motion-activated outdoor video cameras with lights. The Intercept and other media such as CNN.com have chronicled problems with the Ring over recent years, some of which Ring has said it has addressed. The Information in May reported that one’s roommate, partner, guest or spouse might still have access to videos from a Ring device after moving out of the home or apartment where it was installed, even for several hours after the device password was changed. The Information cited complaints from a Miami resident whose former boyfriend apparently had downloaded multiple videos from his Ring device, enabling him to see who was visiting his home. Another security issue cited by The Intercept is the fact that Ring has given its research and development team, based in the Ukraine, access to every Ring video, no matter where it was created. The videos are unencrypted and only a customer’s email address is needed to view his or her videos. The Intercept also notes problems with Neighbors, a Ring’s app that neighbors can use to share suspicious activity with one another, effectively making it a digital Neighborhood Watch program. Users have complained that Ring’s object recognition tools are inaccurate. “Is that a dog or your husband? Is that a burglar or a tree? Ring’s software has for years struggled with these fundamentals of object recognition,” The Intercept reported. To improve its object recognition, Ring also has turned to the Ukraine, where it has hired people to quickly tag objects in videos, distinguishing between a postal carrier and an unidentifiable man, for example. Wirecutter, The New York Times’s online product review site, notes that another issue with Ring and similar devices may be possible violation of state and federal privacy laws. In California, for example, it is illegal to tape a conversation without consent from both parties. That would not apply if someone has broken into a home, but it may apply if the device records the person outside talking. To be eligible for the rebate, residents in attendance must provide proof of residency with a valid form of government-issued identification and a copy of a utility bill. Ring will extend this offer to West Hollywood residents who show up to the event who are not in an Eastside Neighborhood Watch area when the kick-off event is over. The Ring Video Doorbell Rebate Program is a pilot program of the city’s WeHo Smart City initiative, which is an effort to incorporate smart technologies, digital tools and data analytics into city services. I applaud the City for hosting this event and looking at innovative ways to address neighborhood concerns – in this case public safety. I’m a fan of Ring, which started in Santa Monica what seems like just a few years ago. I had their doorbell camera installed at my office for security (we have no peep hole or window to see who’s outside our office door) and have bought one for home use. The recording and sharing of suspicious activity has the potential to be helpful for community and law enforcement officials to identify suspects and hopefully reduce crime. Having said that, it will be interesting to see how well our community fares on the issue of racial bias when it comes to which videos we post and why. Maybe its just my years of working on campaigns and walking with a flashlight door to door to get out the vote, but a person in a backpack with a clipboard knocking at my door on a dark October evening interrupting my dinner is not something I find suspicious (regardless of his race or how much more fashionable he wears his low cut jeans than I ever could). It’s sometimes amazing to see what others get into a panic over online in these video-sharing communities.